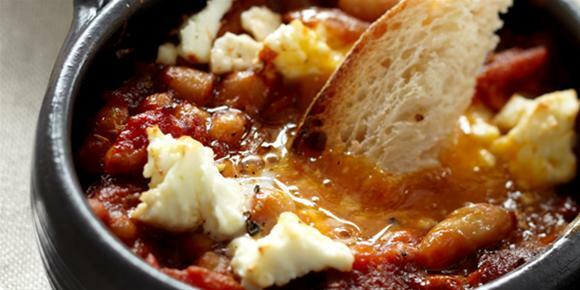 Celebrity chef Karen Martini’s recipe for Spanish style beans with chorizo, eggs and feta makes the perfect brunch or fuss-free dinner, served with crusty bread. Slice chorizo length ways in half, then slice on the angle in half moons. In a heavy based pan add chorizo with a splash of oil. Fry over a medium heat until crisp. Stir in onion and garlic. Add a splash more oil. Add oregano and bay leaf. Fry until onions are brown. Add vinegar, tomato paste, crushed tomatoes and cannellini beans. Simmer to thicken for 6 minutes. Season. Place bean mixture in single serve, oven proof dishes. Make a small hole in each mixture. Gently crack in an egg, top with feta and a drizzle of oil. Bake 8 – 10 minutes for medium to runny eggs. Serve with crunchy bread or toasted fingers. What’s your favourite Spanish food?